Kennedy Dental Care is a new, state-of-the-art facility and Dr. Manny Mangat’s second practice in Brampton. In 2017, Dr. Manny was voted Brampton’s Best Dentist of 2017. Our office is located on the corner of Wexford Road and Kennedy Road North at 220 Wexford Road, Unit 6A in Brampton, ON. If you have any questions or would like to make an appointment, please call our office at (905) 846-3999 or send an email to contact@kennedydentalcarebrampton.com. Dr. Manpreet Mangat (aka Dr. Manny) graduated from the University of Detroit Mercy and obtained his degree in Doctor of Dental Surgery. Prior to this Dr. Manny completed a degree in Electrical Engineering from the State University of New York at Buffalo. He is very empathetic and highly passionate towards educating his patients regarding their oral health. 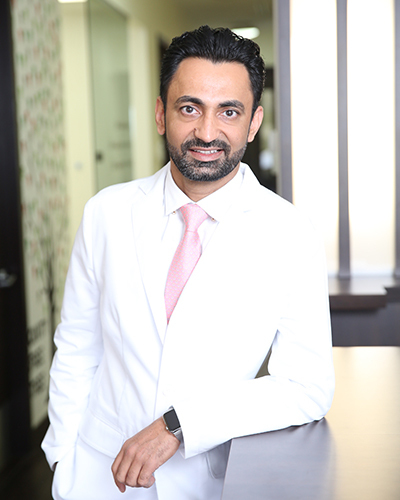 He chose Dentistry as his career following his vision and desire to excel in health services. He closely follows and is eager to learn new concepts and technologies available in the field to constantly educate himself. He effectively communicates with his patients and listens to their concerns to present the best treatment possible. He has been complimented on striving to achieve perfection. One of his many hobbies includes interest in building new things and modifying electronics. Dr. Manny is married and has two boys. He enjoys every bit of his time possible with his family. He is excited and look forward to meeting all the wonderful neighbours and community in the Brampton and Caledon area to best serve them with their dental needs. Dr. Vick loves dentistry! He graduated from University of British Columbia. Prior to this, he was an internationally trained Dentist and has had ample experience in the field of dentistry. He carefully examines and discusses all his findings with his patient prior to making a final treatment plan. Providing a clear explanation of the patient's treatment in priority is what he does best. This helps the patient understand the state of their oral health and helps them feel at ease in the next steps of their dental treatment. With Dr. Vick's experience in the field, he understands and thoroughly takes the time to get to know his patients and does his best to relieve them of their dental concerns and anxiety. Dr. Vick enjoys doing all kinds of treatments. He is interested and confident in a full range of services, especially in Oral Surgery and Endodontic procedures. Baljit strives to provide excellence in patient customer care. She has many years of experience in the dental field along with customer care. Baljit enjoys helping our patients and ensuring that they are well directed. You will hear her pleasant voice over the phone when booking appointments or calling in with general inquiries. Baljit’s calm demeanor helps patient’s overcome any anxieties that they might have when it comes to dental treatments as she explains and answers any concerns. In her spare time, Baljit enjoys spending time with her kids, painting and taking nature walks with her husband. Baljit looks forward to seeing you at Kennedy Dental Care. "You're a diamond dear. They cant break you!" Aman has been working as a Registered Dental Hygienist since 2006. She has had the opportunity to work with all age groups, from young growing families, to adults, seniors and children with braces in Brampton area. She thoroughly enjoys working with children, as she believes early oral care is critical. She makes it her top priority to educate young adults and children regarding their oral care. As a professional and a mother of two young boys, she understands the importance of forming good oral health care habits. She takes many continuing education courses to upgrade her skills to provide the best care possible at the Brampton dental office. You will see Aman at Kennedy Dental Care as your Dental Hygienist, she looks forward to educating you and showing you around this state of the art facility.